General insurance or non-life insurance policies, including automobile and homeowners policies, provide payments depending on the loss from a particular financial event. General insurance is typically defined as any insurance that is not determined to be life insurance. It is called property and casualty insurance in the U.S. and Canada and Non-Life Insurance in Continental Europe. In the UK, insurance is broadly divided into three areas: personal lines, commercial lines and London market. Muthoot Criti care is exclusively desgined for The Muthoot Group customers for covering them against following critical illness. HOME COMPLETES YOUR FAMILY , HOME CONTAINS ALL YOUR VALUES"
Natural Disasters come without a warning and can destroy your home and contents in minutes . Are you ready for the financial impact? Avail Muthoot Home Protector, a Muthoot Group Home Insurance Product, and Covers your home and household goods against multiple risks . As a socially responsible Company keeping in mind the recent natural disasters across the country like Chennai - Floods, Visakhapatnam & Bhubaneswar cyclone, Uttarakhand & J.K - Flood and Landslides, Muthoot Insurance Brokers has come up with a new and unique product for Muthoot Finance Customers in association with Liberty General Insurance - "Muthoot Home Protector"
Muthoot Home Protector is a general insurance product ,which covers your home & household goods against multiple risks arising our of natural disasters which comes without any warning , exclusively designed for The Muthoot Group Customers at a affordable price . Muthoot Home Protector as the name denotes it is a home cover product which covers financial loss occurred due to Fire, Allied Perils, Earthquake, Flood, Cyclone and other Natural Disasters. Not only the structure of the house is covered but also the valuables inside and Burglary at an affordable premium with lot of Value additions to the customer. Premium - Plan wise is given below with different coverage options. 1) Rs. 500/- for Basic Plan having Sum Insured upto Rs.4,30,000. 2) Rs.750 /- for Elite Plan having Sum Insured upto Rs. 6,50,000. 3) Rs.1100/- for Premier Plan having Sum Insured upto Rs.8,70,000 . 4) Rs.1500/- for Supreme Plan having Sum Insured upto Rs.10,90,000. Step 1 : Lodge the details of your loss by calling us on for North, East & West Regions : 011-49484015, 011-46697741 (The Muthoot Group, Muthoot Towers ,Alaknanda , New Delhi -110019) and for South Regions : 9388139520 (Muthoot Insurance Bromers , 4th Floor , Mithun Towers City Super Market , K.P.Vallon Road , Kadavanthra , Cochin -682020) and obtain your claim number. Step 2 : Submit the Claim Documents required for the particular claim to our Branch Office . Step 3 : Surveyor to visit the site of loss and conduct inspection . Step 4 : Company confirms the liability and payment is done through NEFT . Disclaimer : The above information is only indicative nature . For details on coverage , please refer to the policy Brochure or contact our nearest branch office for further assistance . Vehicle Insurance is mandatory that all vehicles running on road in India, should have a valid insurance policy. 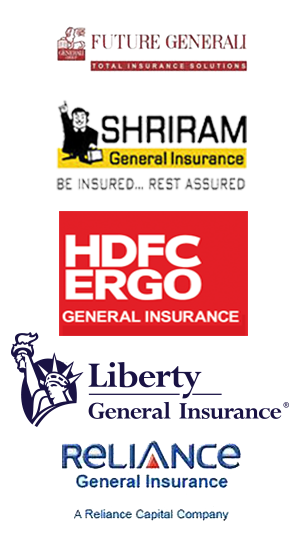 The Muthoot Group provides the Vehicle Insurance (Both Four Wheeler & Two Wheelers ) in collaboration with following insurance companies .